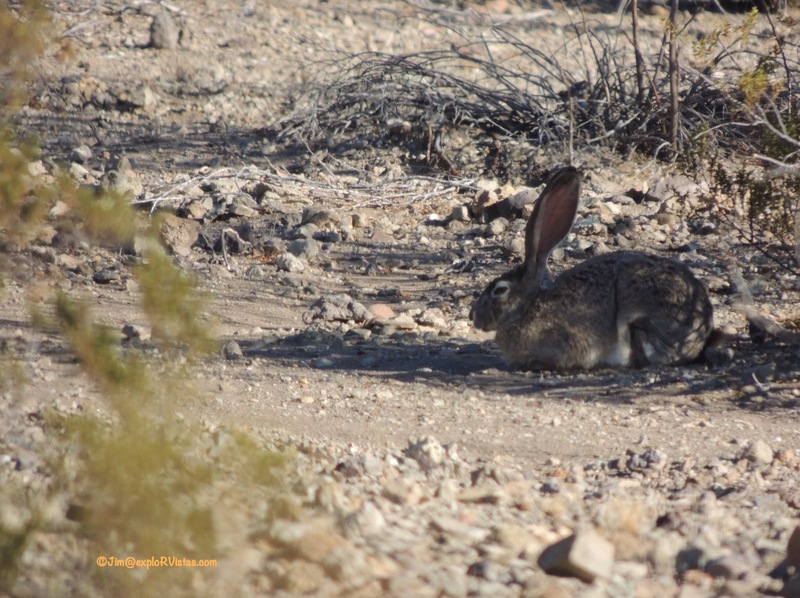 One of the first things we did when we arrived at Big Bend was to go to the Visitor Center at Panther Junction. We always feel that it is a good idea to do that at any park, just to get the lay of the land. After speaking with the ranger about the trails, wildlife concerns and such, we watched the movie about Big Bend. In that movie, they summarized Big Bend as desert, mountains, and river. What a great way to organize our posts on this vast wilderness! 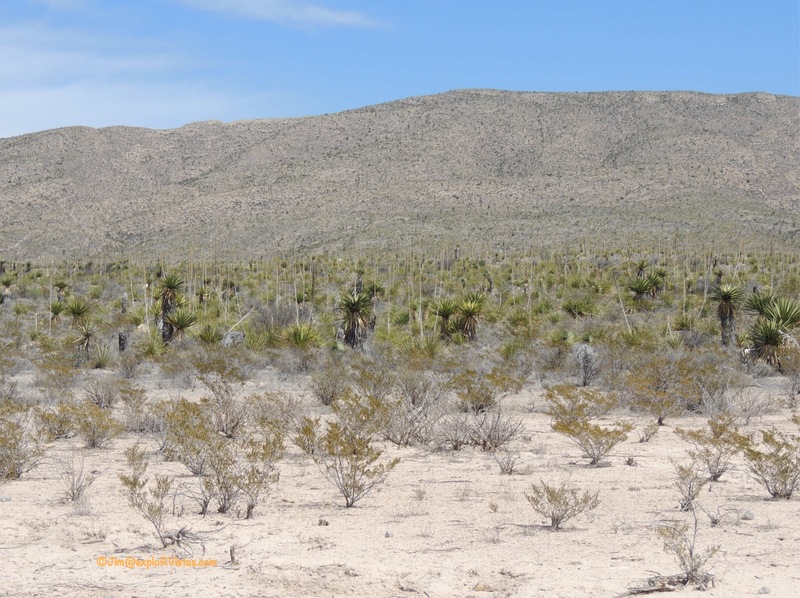 Today we begin with the Chihuahuan Desert. This expanse covers 140,000 square miles of western Texas, southeastern Arizona, southern New Mexico and northern Mexico. Being from the midwestern United States, I was amazed at how much plant life was growing out of what appeared to be hard packed gravel. We really enjoyed walking through the arid landscape and identifying the different plant species. In the southwestern portion of the park is the Ross Maxwell Scenic Drive. We explored this road on Sunday, April 3. 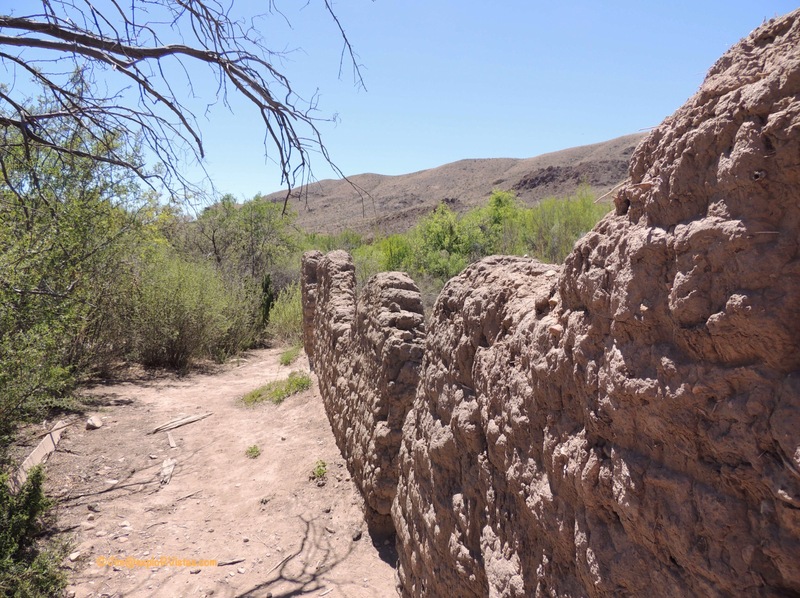 As the road meanders towards Santa Elena Canyon and the Rio Grande River, it passes a couple of ranches that were here before the park was established in 1944. This is the Homer Wilson ranch. 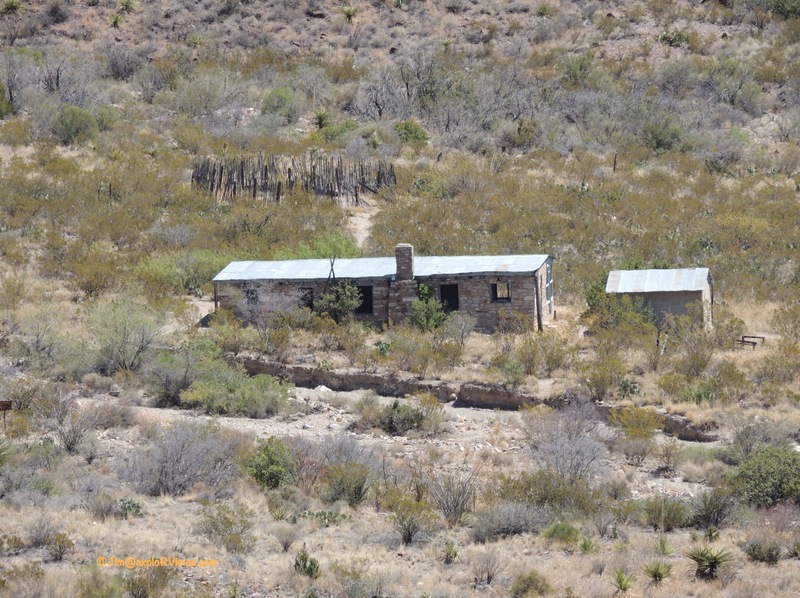 Once the largest ranching operation in the region, all that remains are a few buildings and a corral. Not too far down the road is the Sam Nail ranch. Sam and his brother Jim worked this land with Sam’s wife Nena. Not much is left here but a couple of windmills…one of which is still working and pumping water…and the remains of the house. 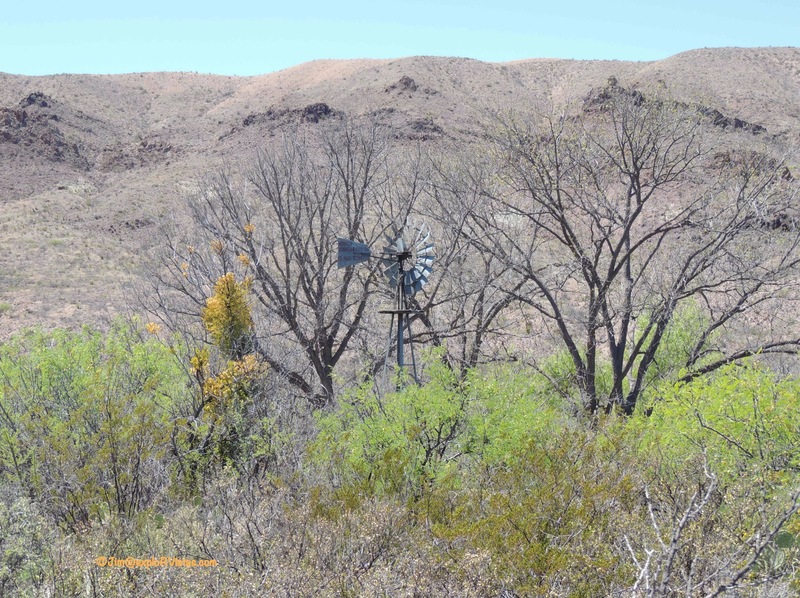 The ranch sits in a low spot in a valley, and the trees growing in the irrigated soil make a cool oasis. 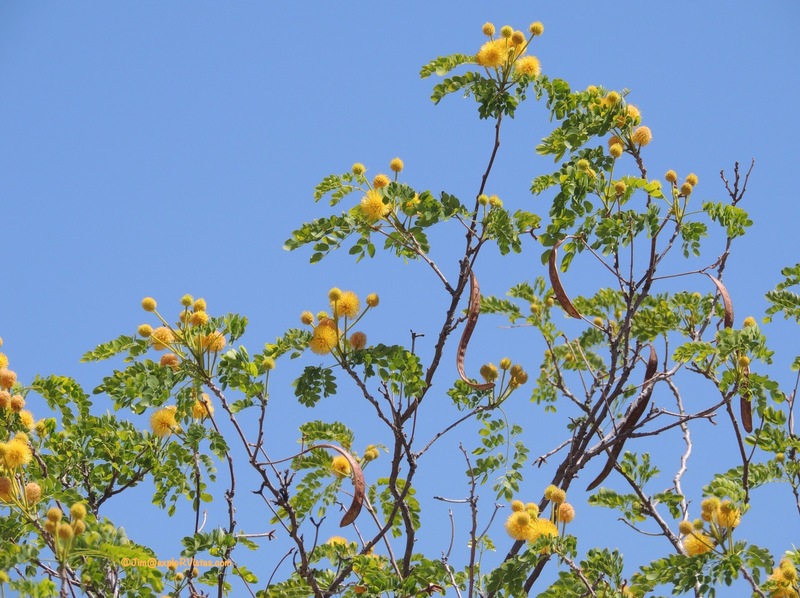 The blooming honey mesquite bushes that surround the ranch were teeming with bees, and the buzzing from their wings filled the air. After following the drive to the river, we came back the Old Maverick Road. This was 17 miles of dusty, rutted gravel road, and the Escape took it on like a champ! 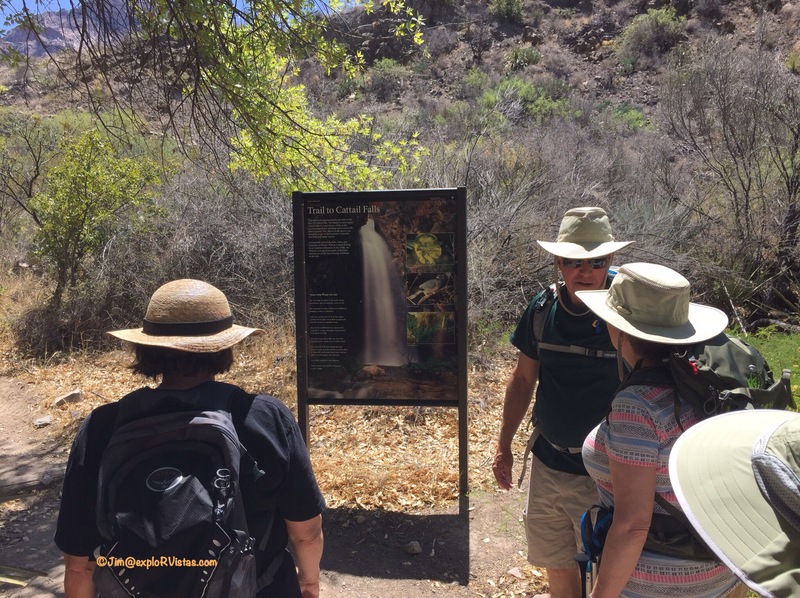 On Monday, we hiked to Cattail Falls with Diana’s cousin Nancy and her husband David. 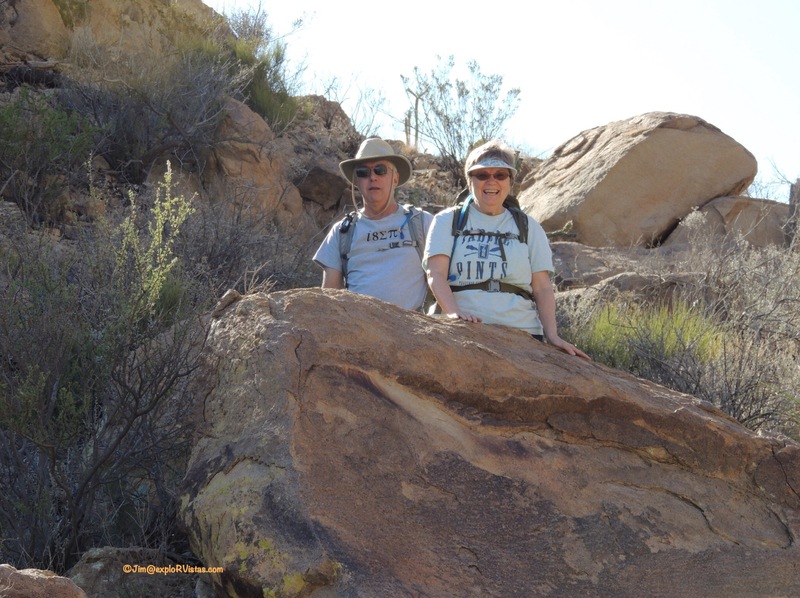 A friend of Nancy’s from Austin, Margaret, was also here visiting Big Bend and joined us on the hike. While the park service doesn’t advertise this hike on the map or trail guide (due to the fragile ecosystem at the end), the trail is well marked at the beginning. 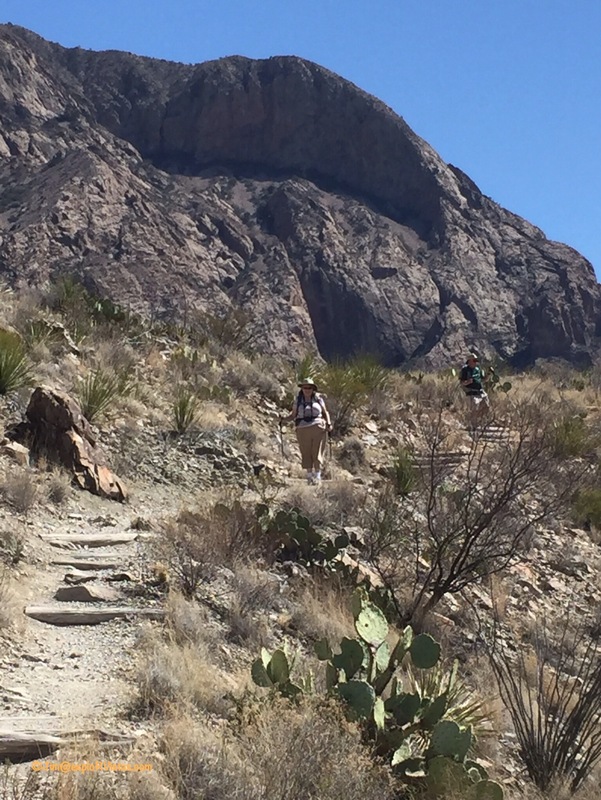 The trail winds through desert landscape for over a mile through the foothills of the Chisos Mountains. 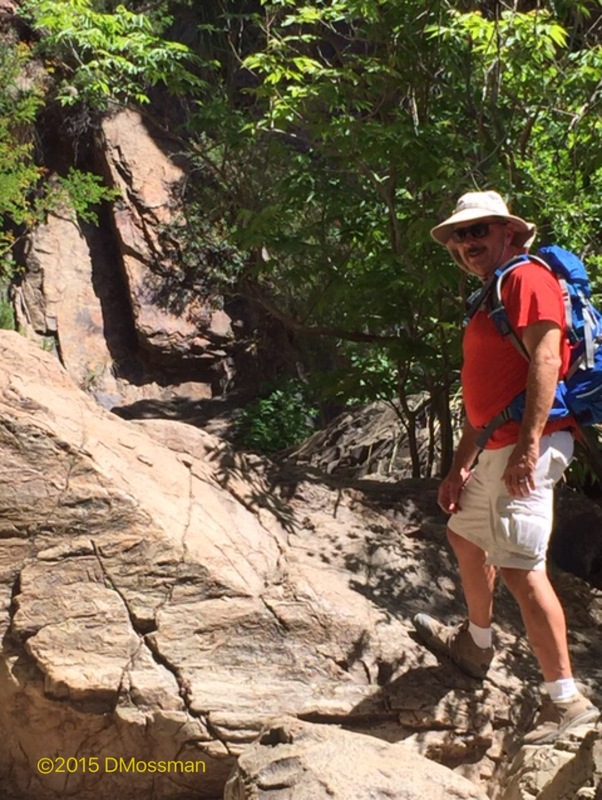 Here I am at the end of the trail, scrambling up the rocks to see the payoff. This is where the waterfall normally is. 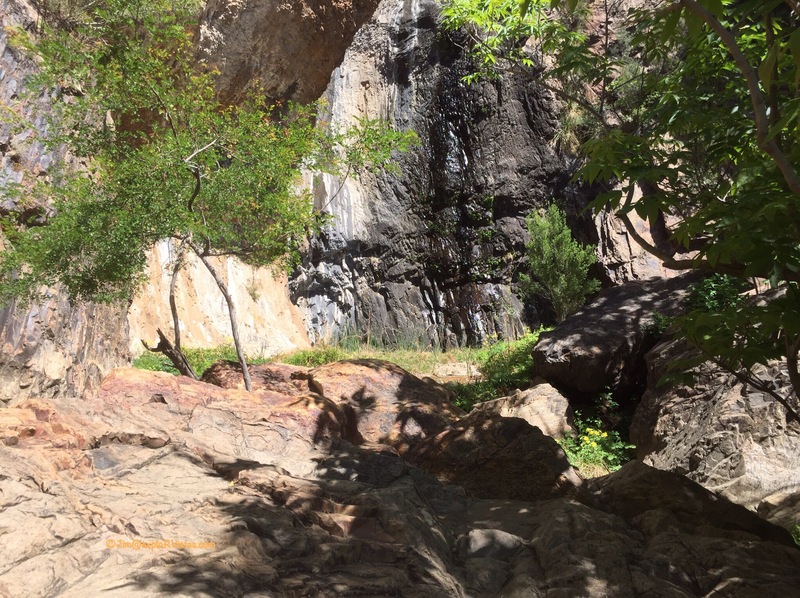 Even though there was just a trickle of water coming off the mountain, the drainage was lush with vegetation. The shade from the trees was welcome relief from the hot sun. 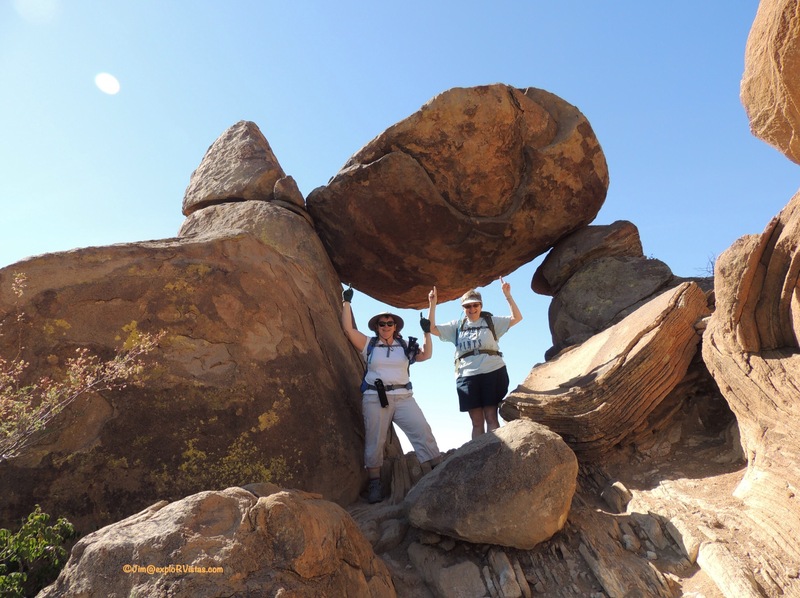 On Tuesday, we met up with Nancy and David for a hike up to Grapevine Hills and Balanced Rock. 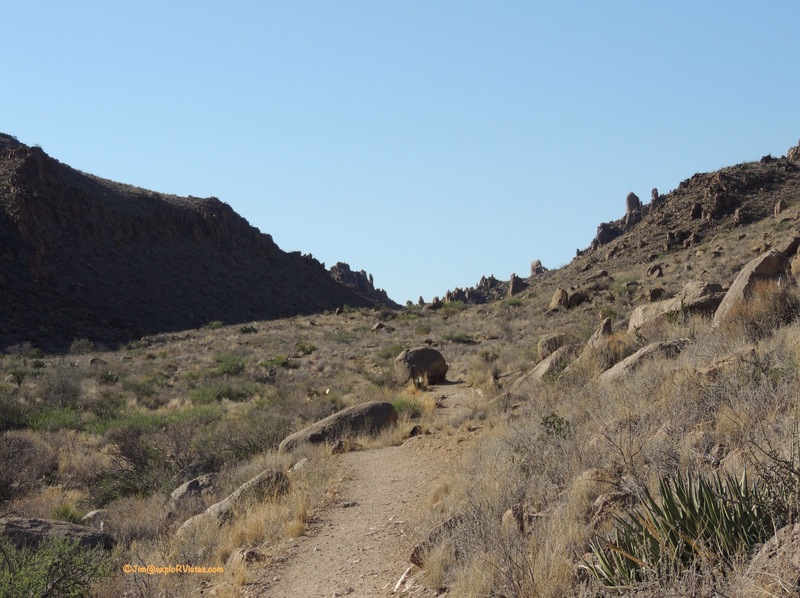 This path leads out through the desert for two miles, and is a fairly easy hike until the end. The last 1/4 mile is up this outcropping to Balanced Rock. Nancy and David, surveying the surrounding landscape. 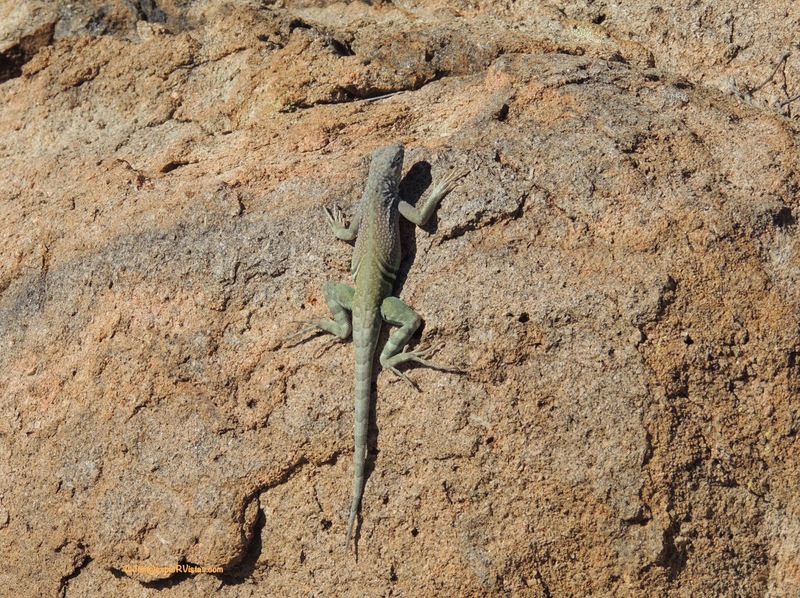 We even had a lizard join us for this climb! After we returned to the trailhead, we made the journey to Dagger Flats. 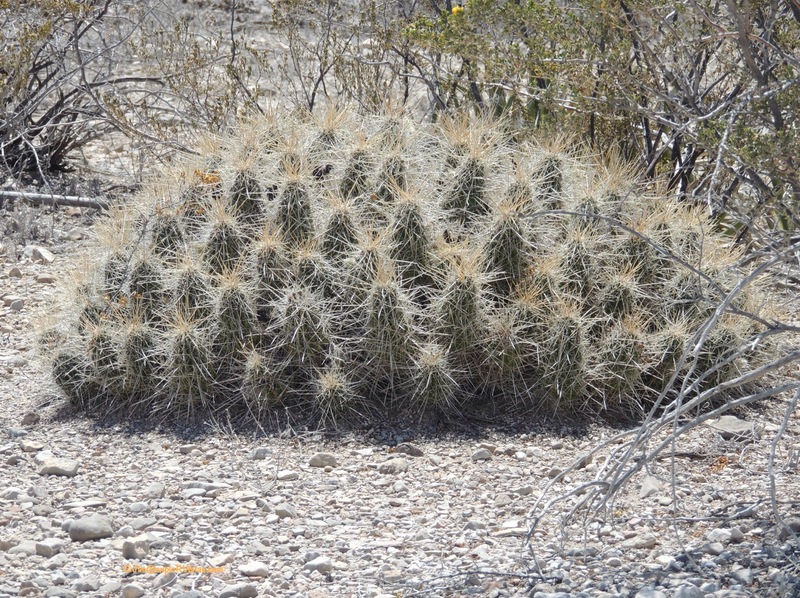 This is more of a drive than a hike, but it features a wide variety of desert flora. A $1 guidebook at the beginning of the trail identifies the plants on this drive. Here is a nice example of a Strawberry Pitaya. When blooming, this cactus features magenta blooms on the ends of the spines. The yellow blooms on the Huisache were in full swing. 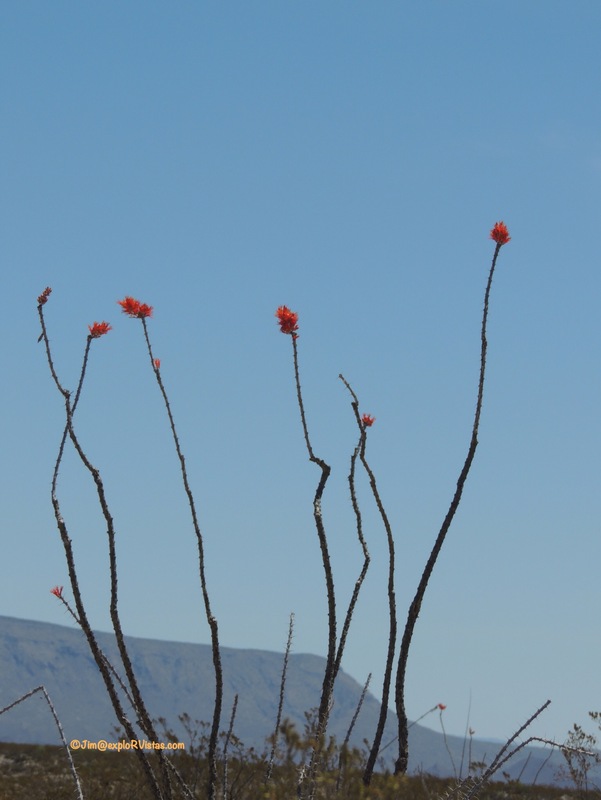 The Ocotillo were sporting their red blooms, but had yet to show their green leaves on their branches. 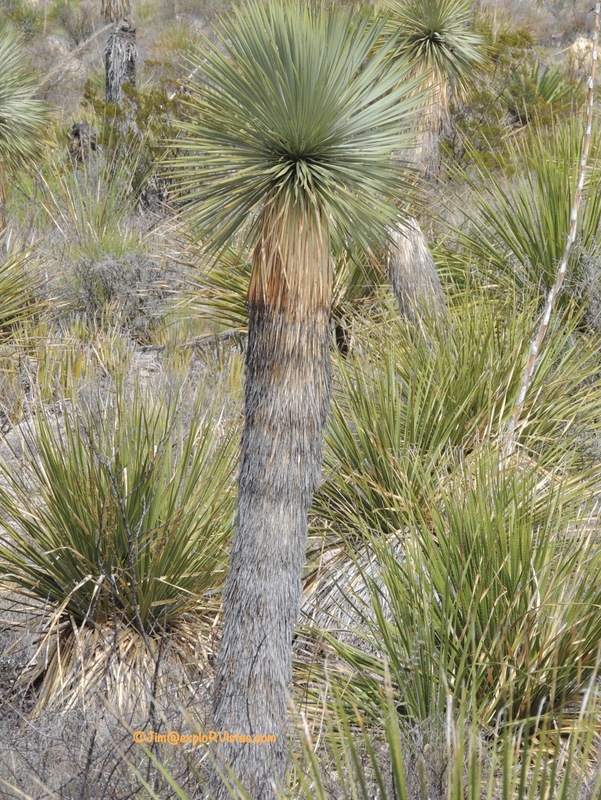 There were several Thomson’s Yucca along the drive. 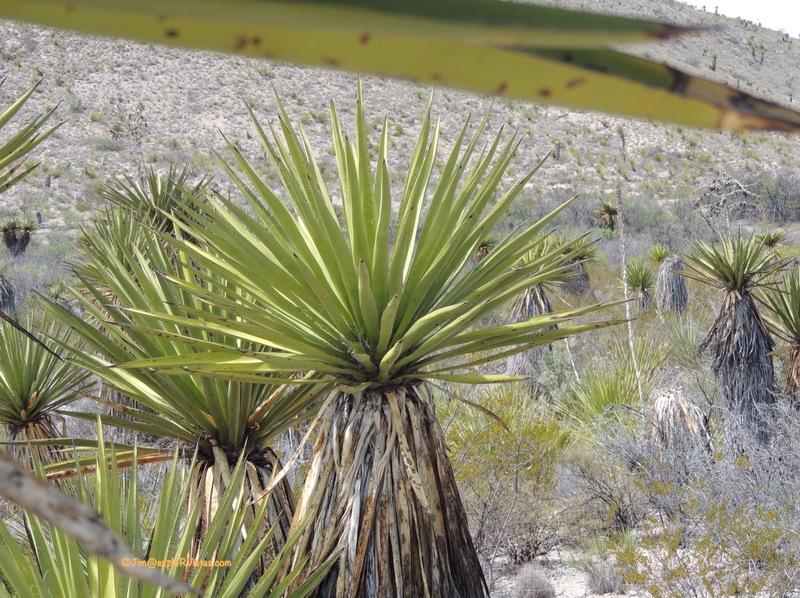 This is the marker plant for the Chihuahuan desert, the Lechuguilla. 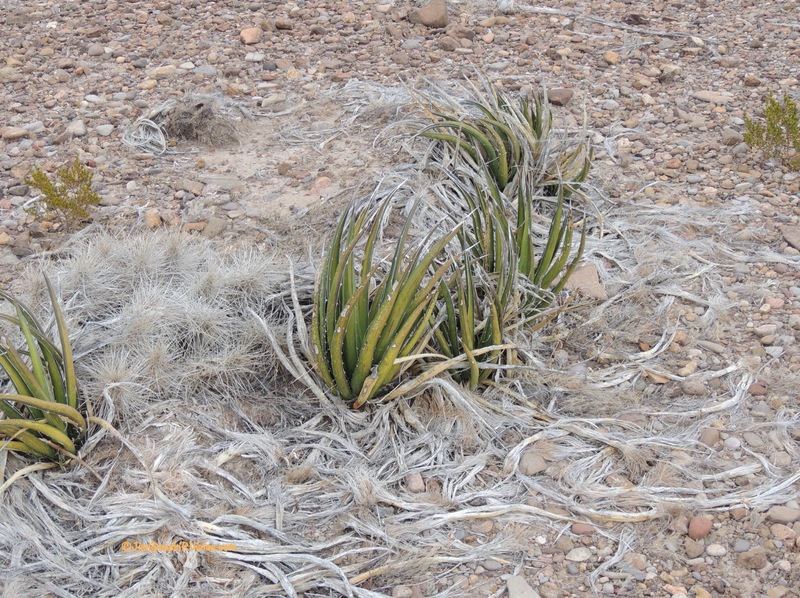 This member of of the agave family can only be found here. 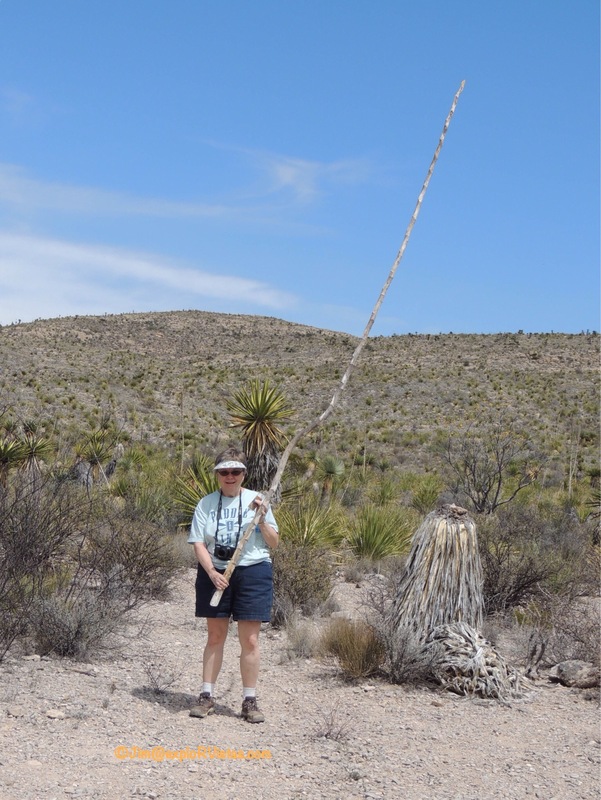 At the end of the drive is an impressive stand of Giant Dagger yuccas. When blooming, these plants sport a showy cream plumage from the top. Not to worry, as Nancy found another type of Giant Dagger! Every national park seems to have a town nearby that visitors flock to after a day of exploring. 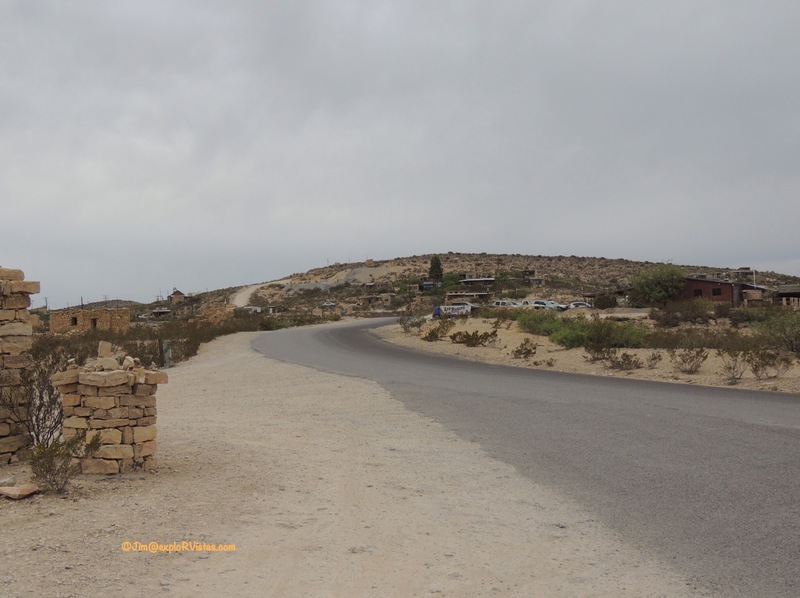 Big Bend’s version of Bar Harbor and Gatlinburg is Terlingua Ghost Town. While there are a few shops here, there’s not the wall-to-wall crowds that are usually seen in national park border towns. 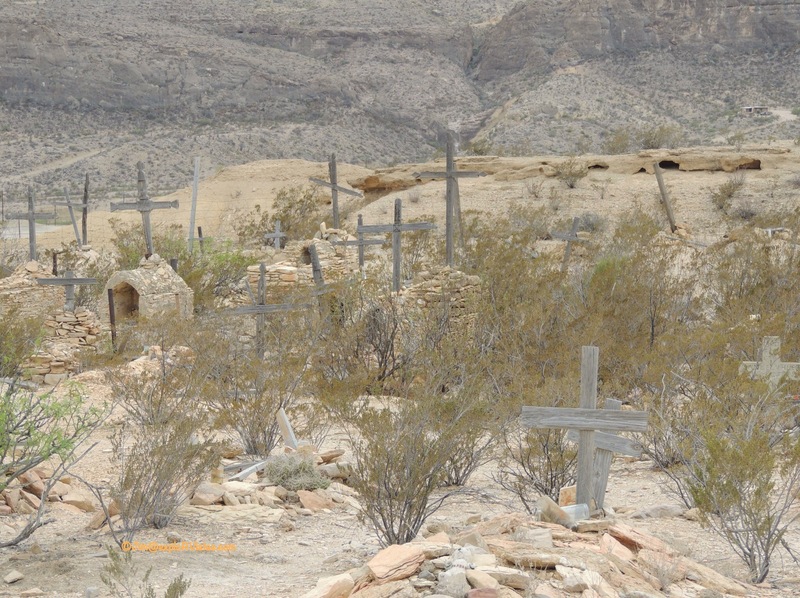 Terlingua has one of the most weathered cemeteries we had ever seen. Most folks here died from disease, mercury mining accidents, or gunfights. 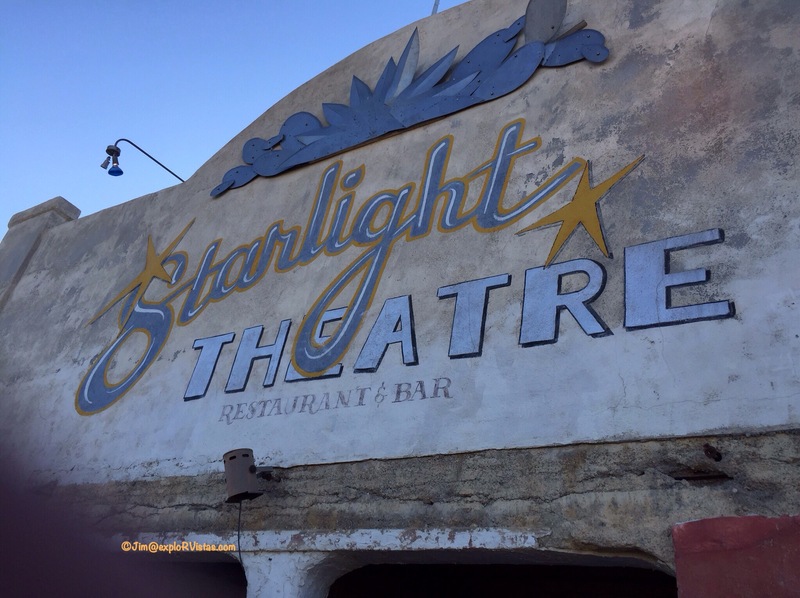 And the town is home to the Starlight Theatre. This restaurant/bar is named after the incredible night sky that puts on a show most nights over the region. We ate here three times over the course of the week. With there being so few choices for places to eat out here, we were thankful that their food was good and atmosphere is fun. That wraps up the desert portion of our Big Bend adventure. Next up is the mountains! 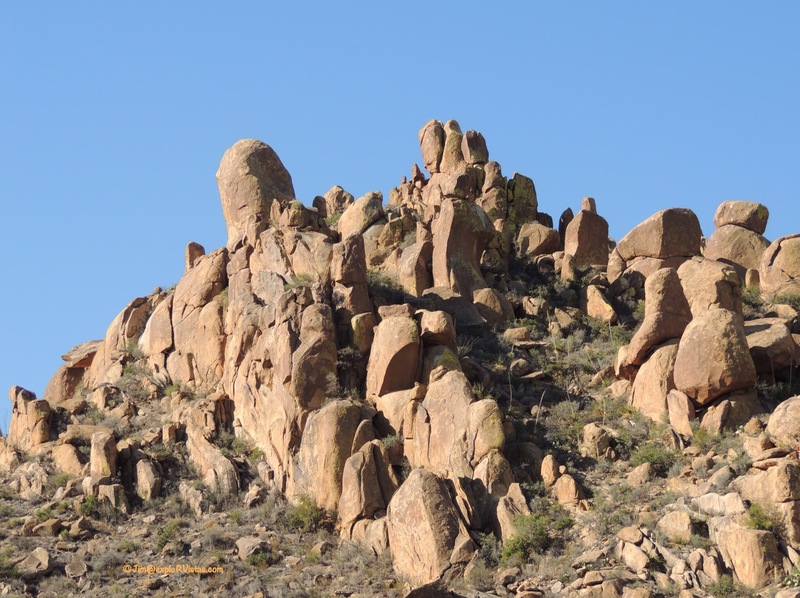 So much fun to read these Big Bend posts and relive our good times there. Thanks Jim and Diana for joining us and for the chronicle. I am amazed at all of the differing landscapes in the state of Texas. 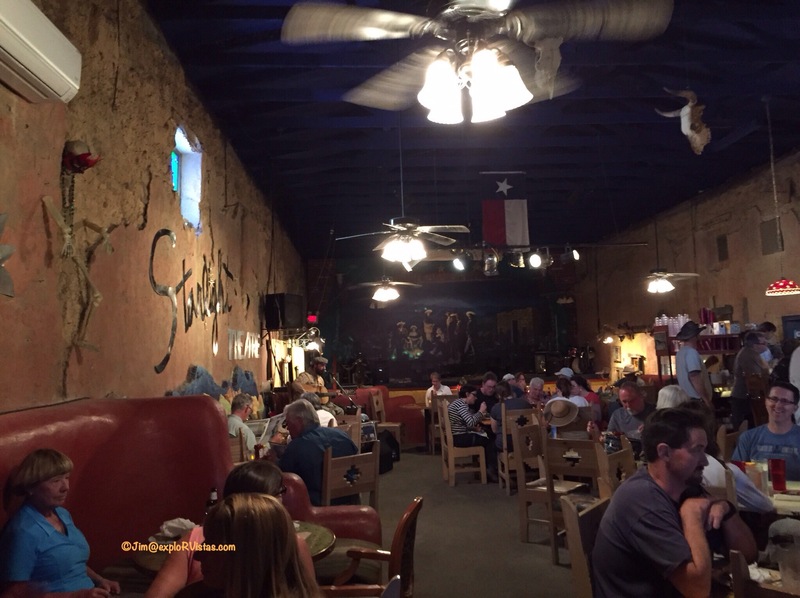 Big Bend looks like it Ned’s to go on the must see list. Fred and I met a couple in Little Rock that were telling us of their 4 wheel drive back road adventures in Big Bend. They loved it too. There sure is a lot of diversity, Bonnie! We did a good job of covering the park, but there still is more we could do. We love seeing old ranches, and the views they had are usually stunning. Looks like fun hikes with fun people. I’d watch out for Nancy with that dagger 🙂 Growing up in the desert I thought everyone saw the stars like that – til I moved away. So much history and scenery in that area. I love seeing the old structures and windmills. It is hard to imagine that they got anything to grow there! Next time you are on I-10, give yourself an extra week to drive down and check it out, Jim! There is a lot to see! 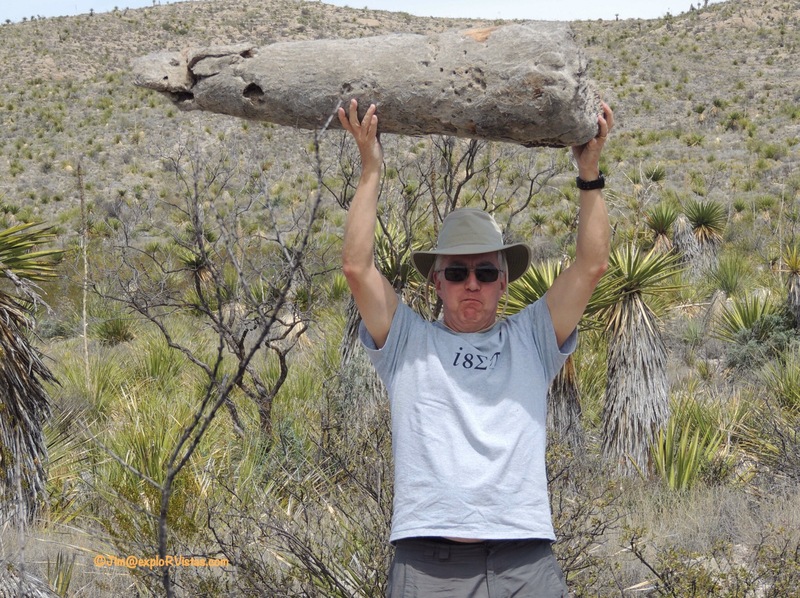 Jim and Diana, I am enjoying the Big Bend posts. Your insight and information on this area is priceless. Big Bend is on my list of to dos. I can’t wait to read more. Thanks and ENJOY!!! !